Telangana State Integrated Common Entrance Test (TSICET 2015) had conducted on 22nd May 2015 from 10.00 AM to 12.30 PM at various centres in all over the state for admission into M.B.A. and M.C.A. courses (full time/part-time/evening/distance mode) offered by the following Universities in the State of Telangana including their affiliated colleges for the academic year 2015-2016. TSICET 2015 had conducted by Kakatiya University, Warangal on behalf of Telangana State Council of Higher Education, Hyderabad. 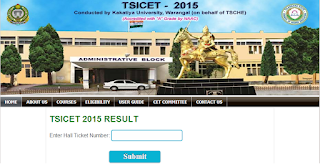 It is the latest news that TSICET Result 2015 has declared on 05th June 2015 on official website www.tsicet.org. Those candidates who had appeared in TSICET 2015 Entrance Exam, they can download their TSICET Result 2015 from direct link provided below. Kakatiya University had released official notification advertised on 28th February 2015. The online applications were invited from 05th March 2015 to 09th April 2015 on the official website www.tsicet.org. The last date for submission of online application with late fee Rs. 250/- was 16th April 2015. TSICET 2015 Entrance Exam was held on 22nd May 2015 at 15 regional Test Centers in Telangana State. There was no negative marking for wrong answers. For General Category / BC Category Candidates - 25% (i.e. 50 marks out of total 200 marks) For Scheduled Castes or Scheduled Tribes Category Candidates – No Minimum Qualifying percentage of marks. 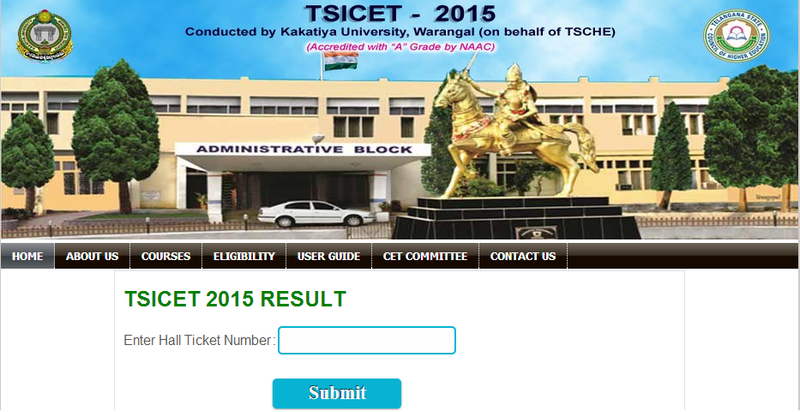 TSICET 2015 Merit List will be prepared on the basis of marks obtained by the candidates in Entrance Examination. Ranking will be given on the basis of total marks obtained by the candidates in Section A & Section B. In case of two candidates have equal marks in. Validity of TSICET 2015 Rank Card – Admission for the academic year 2015-2016 only into MBA/MCA Course (Full Time / Part Time / Evening / Distance Mode) of all universities in Telangana State.